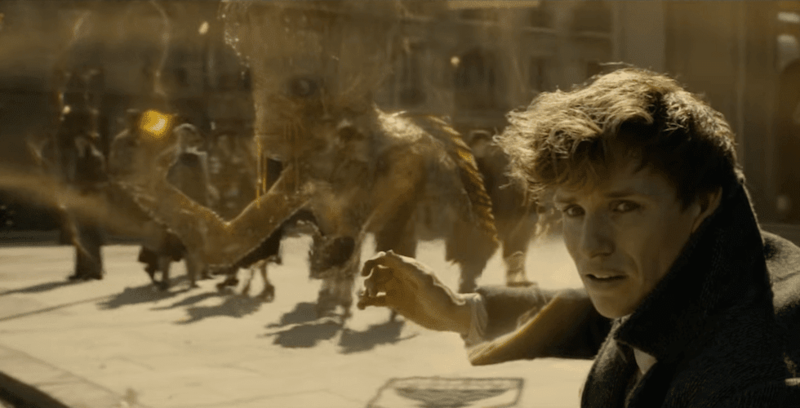 In the new trailer, a sense of dread overwhelms the Wizarding World, as Gellert Grindelwald (Johnny Depp) invites his fellow wizards to join him, “or die.” We also get a look at a woman (Claudia Kim) who Credence Barebone (Ezra Miller) calls “Nagini” as she transforms into a snake – which happens to be the very same Nagini that belonged to the Dark Lord Voldemort. Author J.K. Rowling has since confirmed that Nagini is a Maledictus, which is a woman who was born with a blood curse, passed from their mother, that eventually causes them to permanently transform into a beast. We also got a moment that hints toward the relationship between Albus Dumbledore (Jude Law) and Grindelwald, which most fans had all but given up on at this point after reports that their relationship would not be addressed in the film. The shot of Dumbledore looking into the Mirror of Erised, and his heart’s deepest desire staring back at him in the younger form of the mad wizard (Jamie Bower, returning to the role from the original “Harry Potter” films), is definitely not something you can forget. In “Fantastic Beasts: The Crimes of Grindelwald,” the titular evil wizard escapes MACUSA (Magical Congress of the United States of America) custody and sets out to gather his followers to lead an uprising of witches and wizards to rule over the no-majs, or non-magical people. To combat this threat, Dumbledore asks for the help of former student Newt Scamander who agrees to help, despite the danger ahead. “Fantastic Beasts: The Crimes of Grindelwald” apparates into theaters on Nov. 16. To learn more, visit FantasticBeasts.com.